In the highly political world of diamonds, we all wish that the rigour and vigour we place on the clarity and value of the stones we sell would be applied to the credibility of how these stones get to the market. In this short article I aim to be brutally honest with the chronic deficit of morality, ethics and basic honesty in the diamond supply chain. Firstly the diamond industry and the huge financial value that is ascribed to diamond jewellery is built upon a very tenuous and shallow foundation. The money we make as jewellers comes from romancing the stone, essentially the perceived brand value that the consumer associates with the diamond being the iconic symbol of love, affection and romance. A legacy bequeathed to the jewellery sector by one of the most sophisticated pieces of international branding ever undertaken by none other than De Beers. Essentially this is why a diamond engagement ring is considered as the key gift to seal our cultural tokens of future intentional commitments. If you remove this culturally embedded belief that a diamond is the symbol of pure love, you would have to totally reconstruct the entire jewellery sector and how we all make money. When you add to this, the fact that of the 200 million carats of stones that on average come to market every year, less than 10% of that volume carries over 90% of the annual financial value, we cannot under estimate how important the consumer and cultural belief in the purity of a diamond is to all of our livelihoods*. It is precisely this ‘brand value’ that if lost, would have a cataclysmic impact on the global jewellery industry. So lets consider some other realities we need to manage as diamond retailers. Conflict diamonds, human rights abuses, extreme poverty, political corruption, weak or non-existent industry leadership, the lack of transparency and physical traceability in the supply chain, child labour and forced labour in cutting and polishing factories, systemic smuggling of rough diamonds and illegal mining operations, we can see that there is now another very real, tangible and provable alternative story that is slowly, with increasing force is chipping away at the façade of the well conceited story that a ‘A diamond is a pure product.’ In my book Making Trouble – Fighting for Fairtrade Jewellery, I recall a conversation I had with a Namibian diamond consultant in 2005 who worked with the Russian mafia, helping them to grade and ship stones from Sierra Leone to Russia, where they were integrated into the Russian supply chain and exported under Kimberley certificates as Conflict Free. Technically this is true, those stones were conflict free, but they were illegal and this highlights the profound weakness we face in the diamond industry. We have all brought into the belief that The Kimberley Process protects us from accusations of illegal, immoral and unethical behaviour. The biggest industry secret as we know is that the Kimberley Process is no longer worth the price of the ink used to print the certificates. It has failed and the recent debacle over the non-inclusion of Human Rights definitions into its mandate, precipitated by the massacres and human rights abuses perpetuated by Zimbabwean security forces as far back as 2006/7, which continue as recently as 2013 according to the Guardian newspaper*, in truth represented the final nail in the coffin of credibility. Where do these diamonds go? China. Who is the world’s biggest jewellery manufacturer? China. If diamonds from Zimbabwe can be exported as conflict free, and the untraceable diamonds manufactured in China feed the global jewellery market, then we need to wake up from our Lemming inspired coma and recognise that the diamond jewellery industry can no longer hide behind Kimberley. Sean Clinton heads up a campaign calling for the boycott of diamonds that fund the Israeli governments oppression of Palestinian peoples. Is this state sanctioned violence? Many argue yes and however uncomfortable people on both sides of the argument are going to feel, Clinton’s campaign continues to gain ground because it is another example of how political the diamond has become in the 21st century. Marc Choyt’s recent article on the USA being at the centre of the illegal trade in diamonds is another example of the dark side of the diamond. Diamonds are a political product before they are a jewellery product and represent the biggest weakness in the credibility of the entire jewellery supply chain. To a greater extent this move away from hiding behind Kimberley is already happening. I recently asked a senior individual in DeBeers how the failure of the Kimberley Process would effect their business. The response was illuminating, as for DeBeers, they no longer need KPCS to prove conflict free provenance on their stones. They have been working on and delivering a traceable (from mine to retail) chain of custody for their diamonds under the Forever Mark. This works well if you have the financial clout of DeBeers or the other three big diamond mining brokers, Rio Tinto, Alrosa and Dominion (formerly BHP Billiton*). But for the vast majority of diamond buyers, manufacturers, sellers, traders and closest to my heart the one million small-scale miners who account for around 15% of the global supply – the unwashed non-corporate people – they are reduced to having to work through the Bourses and the shady dealers who sell into them. Where do the diamonds in The Bourses come from? The Bourses represent the greatest opportunity and failure in the diamond trading system to transform the diamond sector, from a rapidly discredited, out of date, medieval closed shop of hand shake dealings, into a fully traceable, transparent supply chain that can serve the greater good of the diamond value chain. If the UK Bourse is typical of the international Bourse scene, we have a real problem. How can it be that diamond goods are traded on a daily basis, with absolutely no disclosure of provenance of source? Given the proven and highly illegal activities in the diamond supply chain, if a trader cannot prove source, their goods cannot be trusted. As a jeweller I need to be able to look my customer in the eye and say were my product comes from. Over the last two years I have listened to members of the Bourse say how traceability and full transparency is impossible. This is in truth the voice of the weak and cowardly and another way of saying ‘We don’t want change, the status-quo suits us just fine and we are very happy serving our own vested selfish interest.’ This kind of parochialism appears typical of the Bourses internationally. No change is the mantra, and weak industry leadership delivers just that. Change is always possible, in fact mandatory and diamonds are no different. But what does a diamond supply chain look like that can begin to meet the enormous challenges and overcome the systemic corruptions of the system. Well here is my tuppence worth of insight rooted in my commitments to fair trade, traceable and transparent dealings in any supply chain. I start from the convictions that supply chain management is the only way to root out the negative and promote the positive. Therefore the first change I would make in diamonds would be to legislate for a reclassification of how we understand the value associated with diamonds. Retain the 4 C’s (colour, cut, clarity and carat) and add a further C (child labour free). Additionally and made compulsory, a disclosure of the 2 T’s Transparency and Traceability should accompany every batch of rough and cut and polished stone. I would retain the Kimberley Process only on the grounds it incorporates a commitment from its members to the Universal Declaration of Human Rights as a mandatory compliance criteria for defining conflict. Now how do we get around the problem of the grading and sorting of stones along the lines of the 4 C’s. To my mind this is not that difficult to resolve. Traders, cutters and polishers should not be allowed to mix stones from different countries. Effectively we ring fence each diamond producing country to delivering only their own diamonds to market. This allows both large and small actors in each country to participate in the diamond value chain as nationals. So Namibia, would mine, grade, export their own stones. The importing country, batch processes these stones, sorts, calibrates, cuts and polishes all the Namibian parcels as Namibian and sells them forward as origin of Country stones. Everyone in the industry knows that the problems stem from mixing parcels of stones from good and bad countries together so they become untraceable. If you make that practice illegal, you take a huge step towards reducing and isolating bad stones from good stones. This is your 2 T’s , traceable to country of origin and transparent, as everyone who touches the parcel needs to be declared on the accompanying documentation. This would act as an upgrade to the current system of warranties that will allow mine to market traceability that removes the vacuous statement ‘As far as the seller is aware’. As I understand it there are only 25 diamond producing countries in the world, so it’s hardly impossible. Naturally this simple outline needs more detail, but this is after all only a short article, not a $10,000 USD consultancy driven paper. Who should pay? The industry should, as recompense for their part in the blood diamond wars and the millions of dollars it made from the misery of the war affected countries. The detractors will say I am naive, overly simplistic, ideological, a fantastic and many other equally interesting adjectives to avoid engaging with systemic change, but I was accused of these things when I articulated Fairtrade certified gold and traceability in the gold supply chain and then modelled through the jewellery company I ran at the time. Our current diamond supply chain is the closest imitation I have come to the conceit and vanity of the self serving Emperor as he rode through the streets naked for all the world to see. The only person he was deceiving was himself. If we want to avoid the ridicule of our industry nakedness, change is needed and it is needed now. The opinions in this article are the views of the author only. Fairtrade Gold. It’s easier than you think. 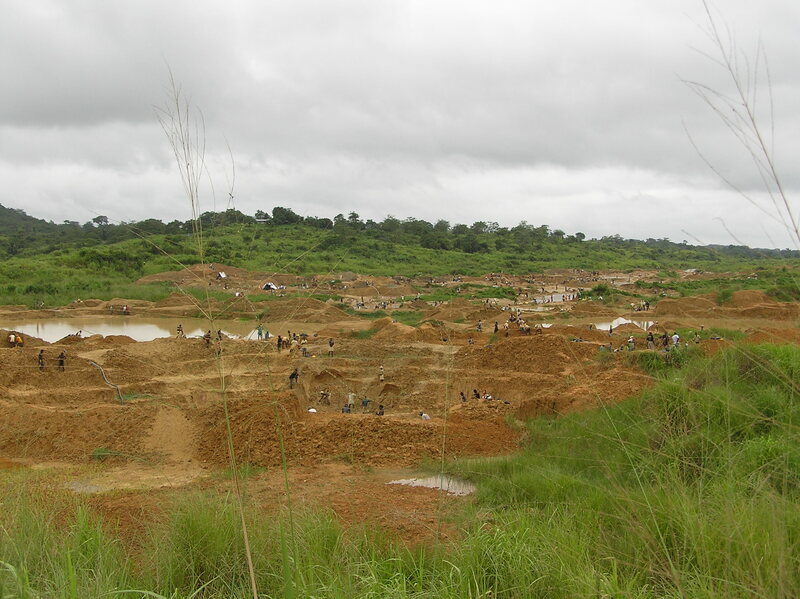 Previous Post Fairtrade Gold - The Best Gold Story in the World. Next Post Are you one of Fairtrade gold's 50,000? Thanks Greg, this is a very thought provoking article that gets to grips with the fundamentals of the diamond industry; the collective – almost mystic – delusion that we are all complicit in propagating as to the nature and value of diamonds; the fundamental weaknesses in the current supply chain; and the vested interests that benefit from them.